Let's face it: Chinese take-out really hits the spot sometimes but it's usually loaded with lots of fat and sodium. Here's a recipe for a healthy lo mein that's quick and easy to make at home. When you take the reins at the stove, you get to control the amount of oil and salt you use. This dish has just enough of both to recreate the flavors you get from the restaurant without freaking out your doctor. Bonus: You can add as many vegetables as you like, making this an all-in-one meal. We use broccoli here but feel free to add bell peppers, carrots, and snow peas. Lo mein is traditionally made with egg noodles. If that's not readily available, you can substitute whatever strand pasta you prefer. Just make sure to adjust your cooking time so you don't overcook the noodles. You don't want them to turn to mush but if that's your thing, go for it! Per Serving: 334 calories; 15g fat; 27.6g carbohydrates; 23g protein; 45mg cholesterol; 1467mg sodium. Just like take out! But better, because no MSG and preservatives. Seriously so quick, easy, and just like Chinese takeout. Lo mien is definitely not in my comfort zone, but when I saw the video with this recipe I totally plucked up some courage and went for it. So glad I did! Delicious with authentic (at least in my Californian opinion) flavors. 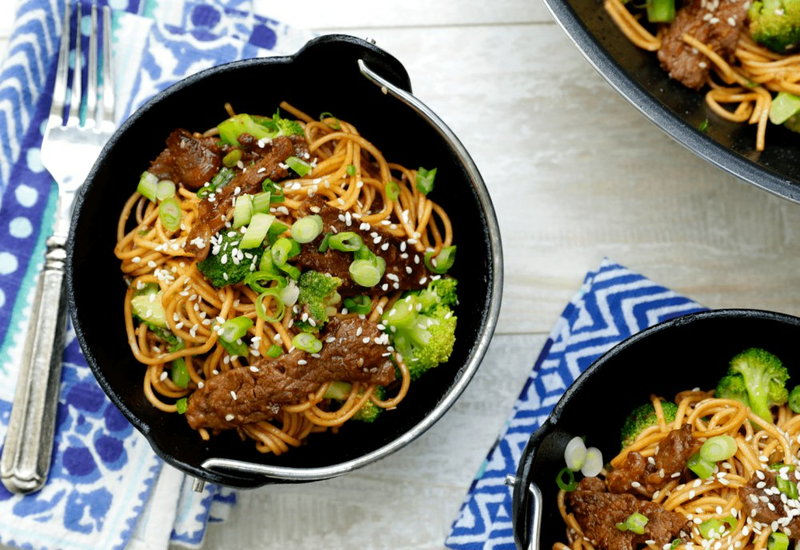 This beef and broccoli lo mien is definitely better than take out! The flavors are incredibly authentic, not too much ginger, and the sauce is perfect. It was also very easy to make and ready to eat in under 30 minutes. I can't think of a better dish when you want something delicious, quick and easy. Beef and broccoli lo mien is my favorite! I can't believe how easy this recipe was to make. This is perfect for weeknights and also to pack for lunch. It tastes even better the second day after the sauce sets in. I don't even order take out anymore after making this. I have no idea if my local store carries lo mein noodles, so is it terrible that I used spaghetti pasta? It turned out really good, so I've been using it every time I make this recipe. My kids love it and it's super easy to make on weeknights. So I totally didn’t cook the noodles and had to add a TON of water in the skillet to get them to cool but OMG this dish still came out delish! Didn’t have fresh ginger or fresh garlic but idk I think it still tasted awesome. And made enough leftovers for like 2 more meals!